Back in the fall of 2012, I decided to tackle one of the goals on my TTE Designs 'to-do' list. I was hoping to have some of my work published [some day far in the future] and so I did my research and screwed up my courage and submitted several pieces. 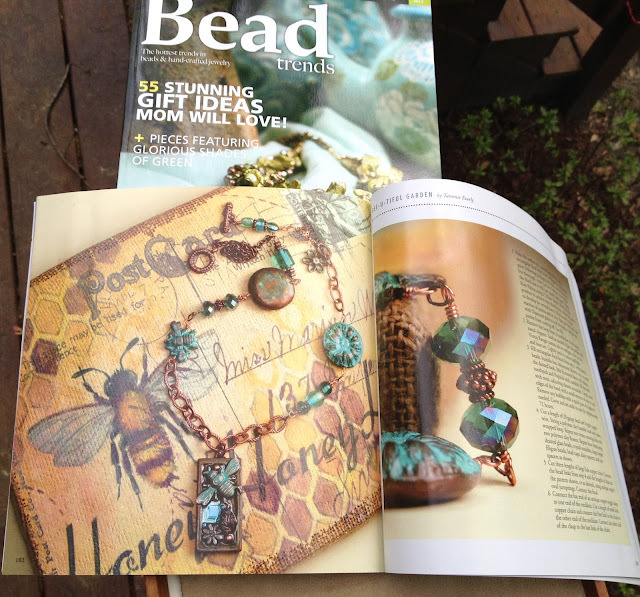 I chose Bead Trends Magazine because their application process is online. 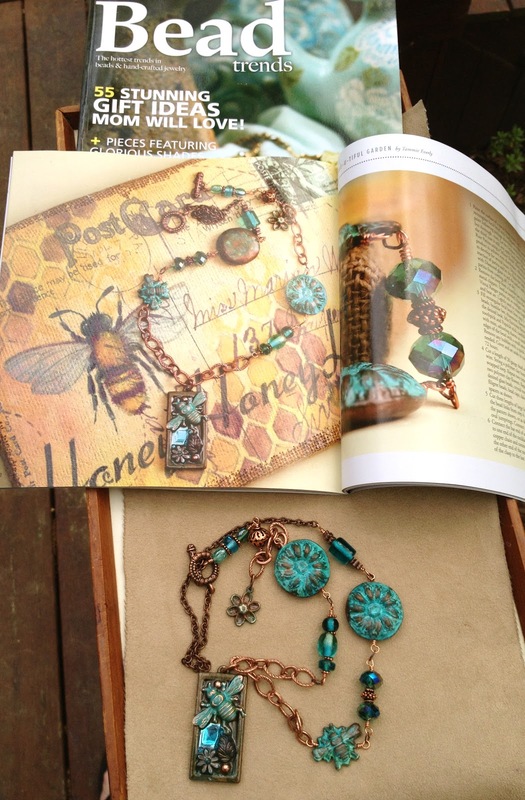 The following Tuesday, I got an email saying that the publishers wanted to include my work "Bee-U-tiful Garden" in the May 2013 issue of their magazine in the mixed medium category. I was thrilled and panicked as I read through the guidelines that asked me to send it in immediately. I couldn't believe my good and bad fortune all rolled together. I emailed the publisher, Tatia, and explained my situation. I had or could re-make many of the components, but the focal was an old broken shoe clip from a thrift store that I had repurposed and couldn't be replaced. She said if iI could redo it closely, they would still accept it. So I FLEW to Michael's to see if I could find some type of bezel to be a focal. I came up with a rectangular bezel that I thought would suit and got to work. 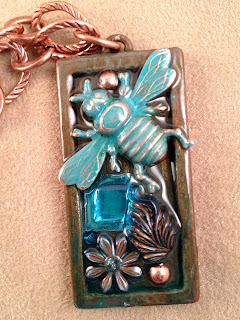 I had also recently purchased some metal 'bee' charms from B'Sue Boutique and thought that would be a good accent to my new piece. I spent the next few days, molding, patina-ing, resin-ing and connecting until I had a pretty good replication of the original. 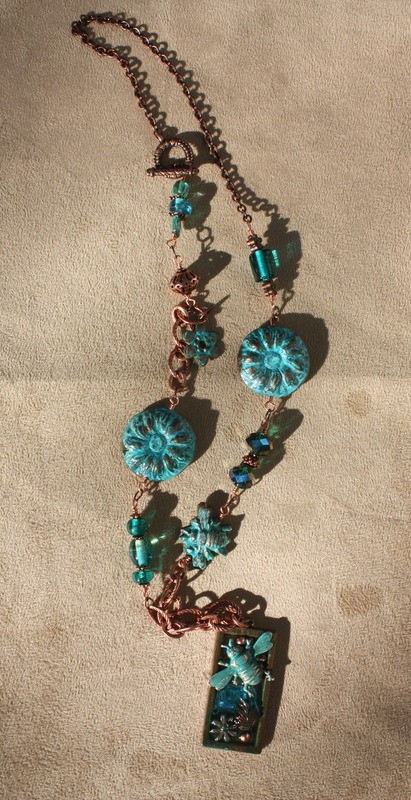 As with any handmade piece there are some variations, it turned out a bit 'brighter' than the original. I boxed up the piece with the detailed 'how-I-did-it' description, as requested, and sent it to Utah ASAP. 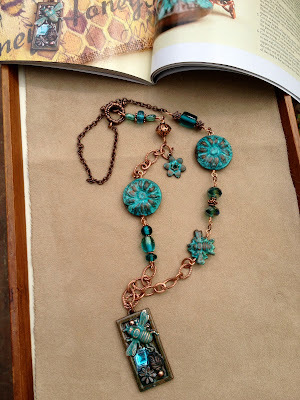 Yesterday, I got a non-descript box in the mail, which contained my necklace, two copies of the magazine and a $20 Fire Mountain Gems gift certificate as a thank you gift. Thank you for stopping by and sharing in my milestone. 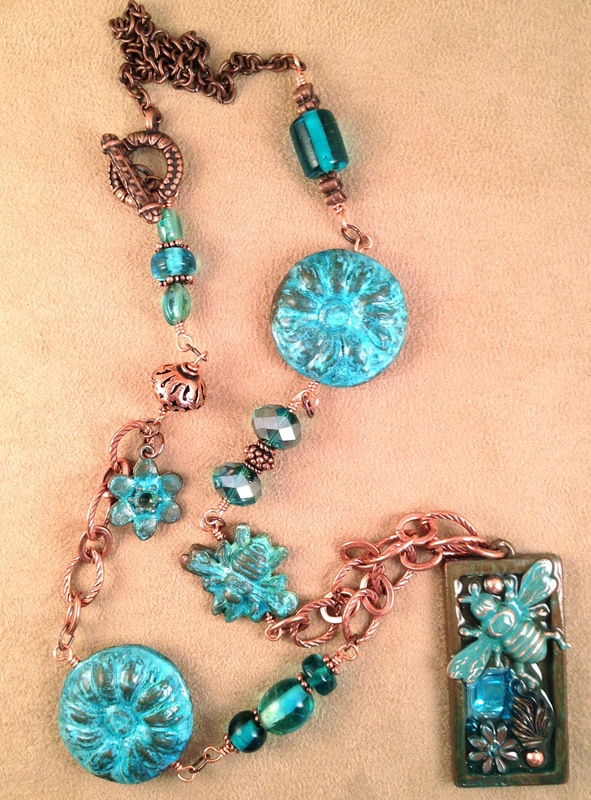 I am pleased to say, that 2 other of my assemblage works are scheduled for publication in the June and September issues of Bead Trends. This has given me the courage to submit to other venues as well and if I am lucky enough to be selected again I will share it here. 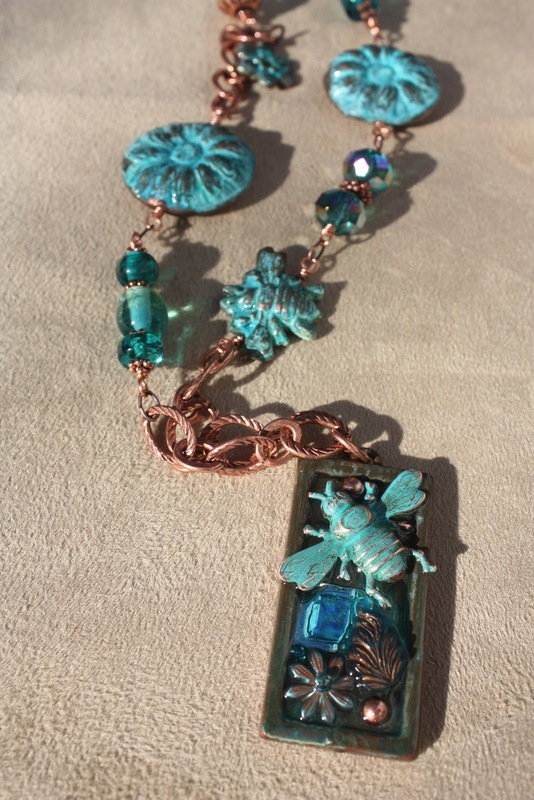 Its gorgeous Tammie! You are SO talented and good at this. Congratulations! Wow! 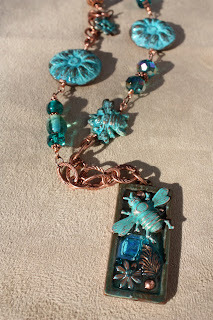 The necklace is gorgeous and they did a great job showing it off! 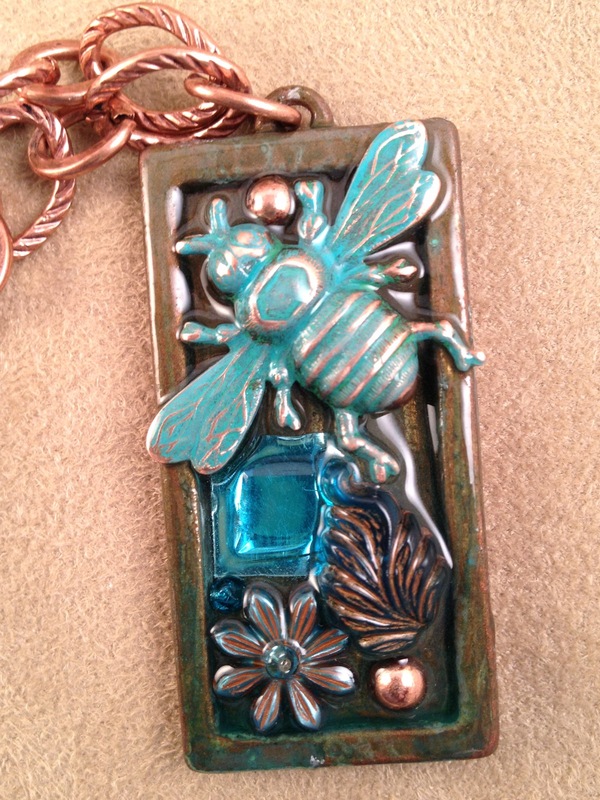 HaHa, that is one weird event, selling the piece you had submitted, I mean, Tammie. I'm glad I was checking back on posts before going to bed, or I might have missed your announcement. Congrats, and YOU DESERVE THIS, girl! What a thrill for you, to see your gorgeous piece professionally photographed and published! Congrats! I know how excited you are. I have some earrings that will be in the July issue. It is my first publication also!